This shrine is not dedicated to a saint, or affiliated with any organized religion. The fine print on the entrance sign states that it’s a furniture museum. I guess “wild and wonderful example of what one man who had an artistic vision and a way with wood did with nothing but his imagination, patience, and hands” wouldn’t fit on the board, and passersby on busy M-37 wouldn’t slow down to read it anyway. Shrine of the Pines is tucked into the woods on the Pere Marquette River, just south of Baldwin in the north central area of the Lower Peninsula. Built by Raymond “Bud” Overholzer, it’s one man’s tribute to to the forests, specifically to the white pine, that had been cut down during the heyday of the logging industry. Bud saw beauty in the carnage of the cutover land and turned remaining stumps and roots into organic furnishings, a passion he pursued from the 1930s until he died in the early 1950s. 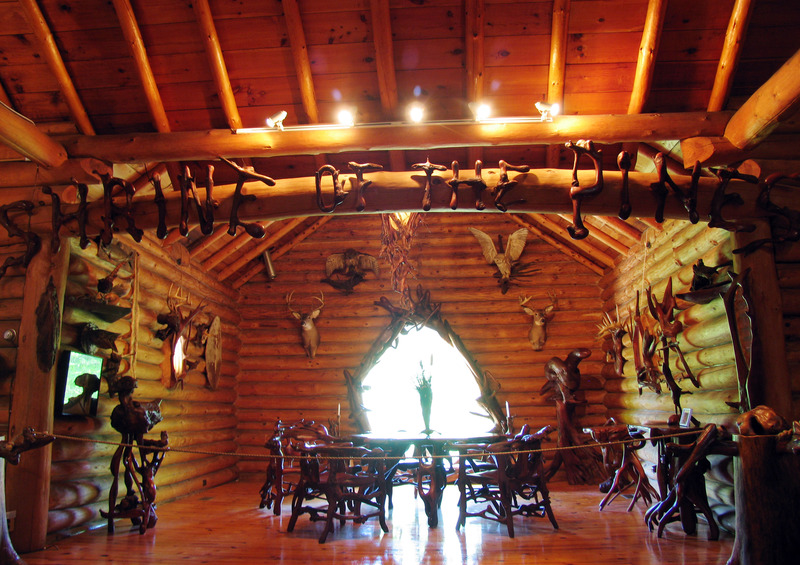 His amazing creations are on display in a log cabin he’d planned as a lodge for the visiting hunters and fishermen that he guided nine months of the year. During his three-month off season Bud pursued—seemingly obsessively, although caretaker/tour guide Shirley Foss never used that word—this tribute to the trees. 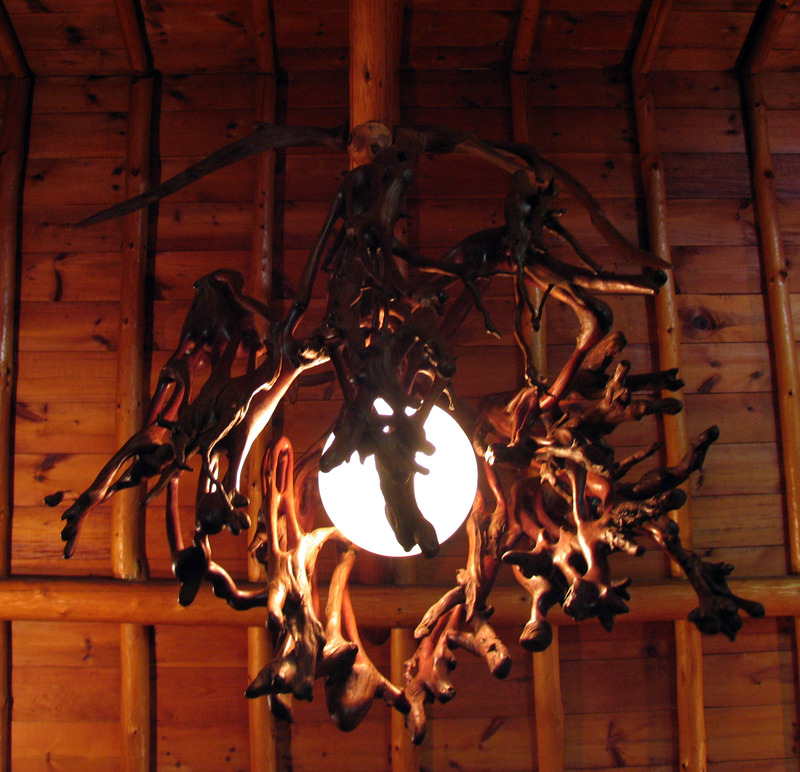 He followed three principals in crafting his one-of-a-kind furnishings and fixtures, says Shirley. “They are all made of white pine; each has a purpose and a reason; and they had to be free.” She explains, “He made his own glue. He made his own sandpaper using crushed glass.” Bud used handmade pegs, not nails, and no power tools; some of his hand drills are on display. She starts the tour at a huge sideboard carved from a single tree—drawers, shelves, and all. 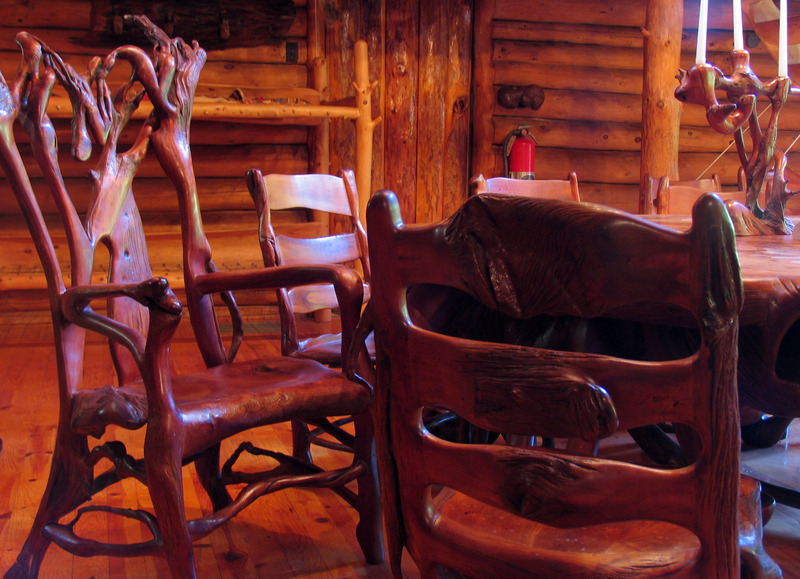 Next to that, and dominating the large room, is a seven-foot in diameter dinner table made from a massive, 700-pound stump, surrounded by a dozen chairs. 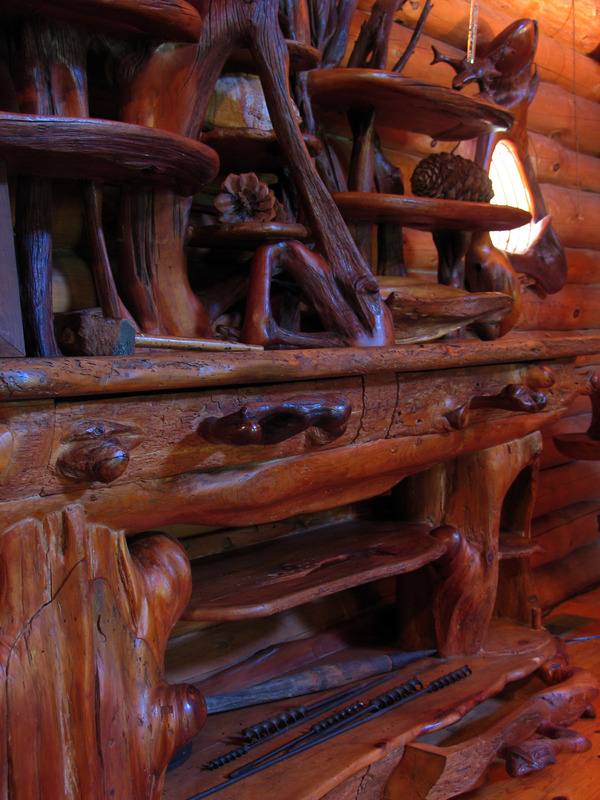 The rocking chair is just one example of the ingenuity that starts at the 300-pound front door, which is made of pine logs and turns on a wooden ball. There’s an impossibly balanced chandelier that incorporates an antique glass globe, and a bootlegger table with a hollowed out trunk for stashing liquor bottles. Fantastic candelabras and twisted frames for mirrors and windows. A cynic might wonder what was in that homemade glue. 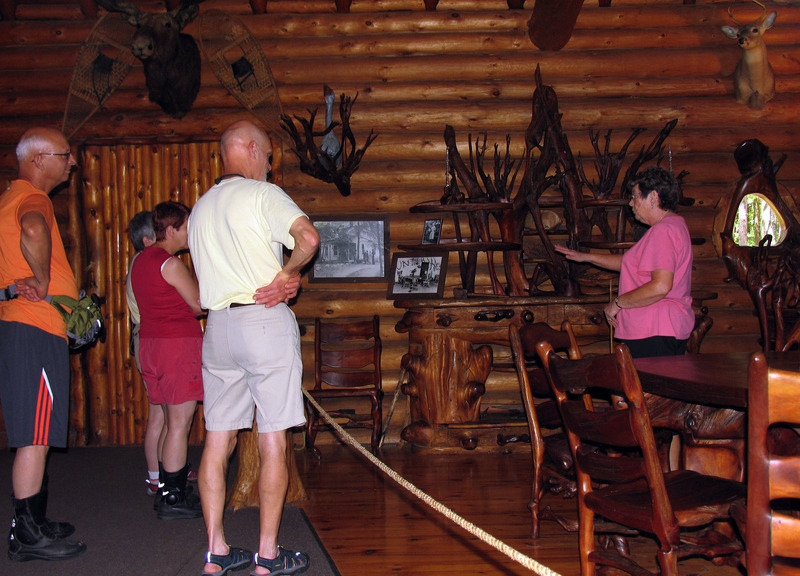 Shirley shares dozens of details about the lodge, which was never used for its intended purpose. As the collection of pine furnishings grew along with public curiosity about the project, Bud and Hortense decided to turn the effort into a museum and charge admission. He died at age 62 in 1952 and his wife, who was 24 years his senior (and his former elementary school teacher) followed him in 1959. “It’s just unreal what that man did,” says Shirley’s husband Rex, who first saw Shrine of the Pines in the 1950s when he was a 16-year old summer visitor to the area.”This was a highlight of that trip,” he recalls. He returned with Shirley as one of a series of couples who stay for a season or two in the cabin where Bud and his wife lived, caring for the structures and grounds and conducting tours from mid-May to mid-October. Got An Ice Cream Jones? Will the Shrine be open on Labor Day weekend, 2012? Thanks for checking in at Great Lakes Gazette! It’s amazing, isn’t it? A real hidden gem. Thanks for checking in at Great Lakes Gazette!